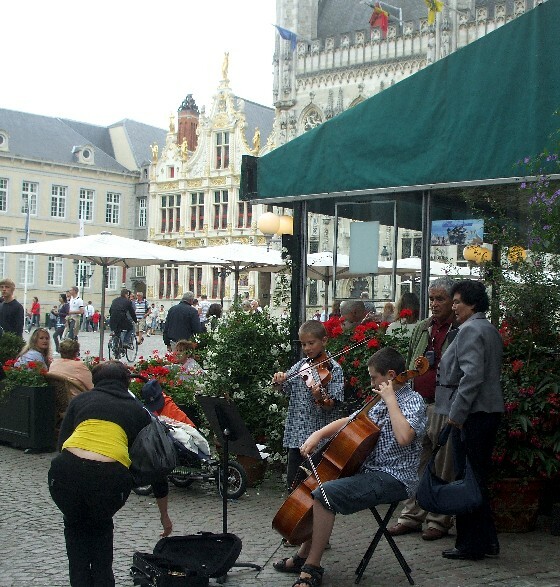 The Burg Square in Bruges is right next to the much larger Market Place (Markt), but is just gorgeous. 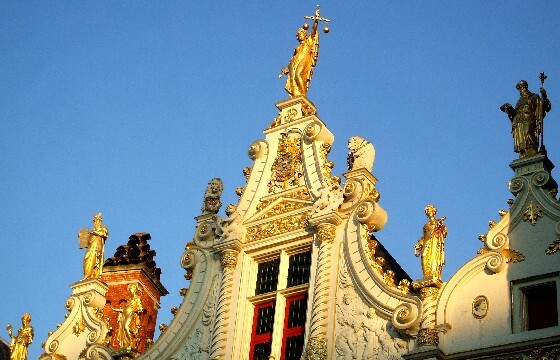 It’s here that you’ll find the tourist office, but also some of the city’s most beautiful buildings. Top of the list is the historic Old Town Hall, which is well worth visiting to see the impressive paintings on the walls. Also here is the Old Civil Registry, the Basilius church and the Chapel of the Holy Blood which claims to have a vial of Christ’s blood. 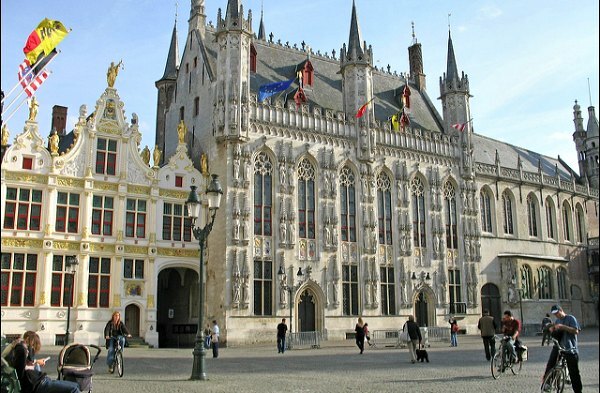 We think that the most impressive building in the Burg is the Old Town Hall, dating back to the 1300s. The picture above is of the rooftop of the Old Civil Registry which is located to the right of the Old Town Hall. This building was completed in 1537 but the decorative statues were destroyed in 1792, before being restored to the way you see them now. They represent Justice, Moses and Aaron. Burg Square is the administrative centre of the city, but it would actually be easy to miss it. The most impressive way to enter and leave is via the cobbled pathway of the same name which leads through an arch in the Old Civil Registry and over a beautiful canal bridge. The Burg square also incorporates an attractive urban garden area. The Burg is linked to the Market Place by Breidelstraat. The streets around the edge of the small square are known as Burg and De Garre (see map below).